Heat oven to 350°F (325°F for dark or nonstick pan). Generously spray bottom and side of 8- or 9-inch round cake pan with baking spray with flour. In large bowl, beat cake mix, water, 3 tablespoons butter, the almond extract and egg with electric mixer on low speed until moistened, then on medium speed 2 minutes, scraping bowl occasionally. Pour into pan. Bake as directed on box for 8- or 9-inch rounds. Cool in pan 10 minutes. Remove from pan to cooling rack. Cool completely, about 1 hour. Meanwhile, place white chocolate and 2 tablespoons butter in medium metal bowl. In 1-quart saucepan, heat whipping cream over medium heat just to boiling. Immediately pour hot cream over white chocolate and butter. Let stand about 5 minutes or until mixture is melted and smooth when stirred. Let stand until room temperature, about 1 hour. Beat cooled white chocolate mixture on high speed until fluffy. Cut cake horizontally in half, using long, sharp knife. On serving plate, place 1 layer, cut side up. Spread with 1/2 of the filling; top with 1/2 of the strawberries. Add remaining cake layer, cut side down. Spread remaining filling over top of cake; top with remaining strawberries. Store covered in refrigerator. 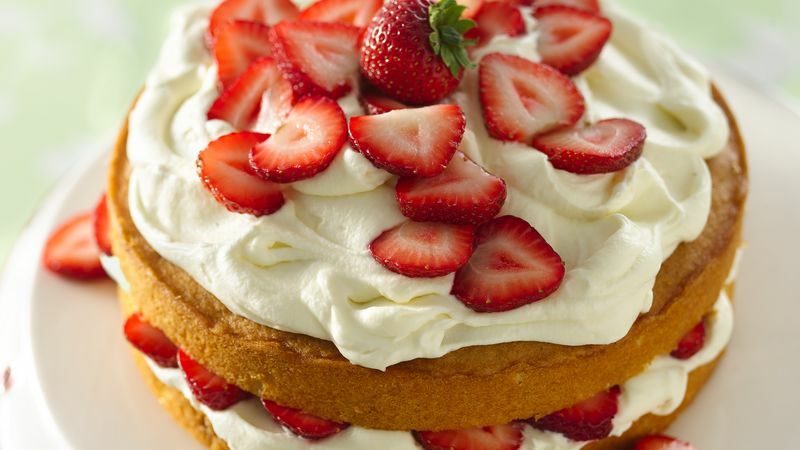 This is the perfect cake to make and enjoy with freshly picked strawberries. This recipe is a twist on the all-time favorite Strawberry Shortcake. White chocolate adds an unexpected special touch.